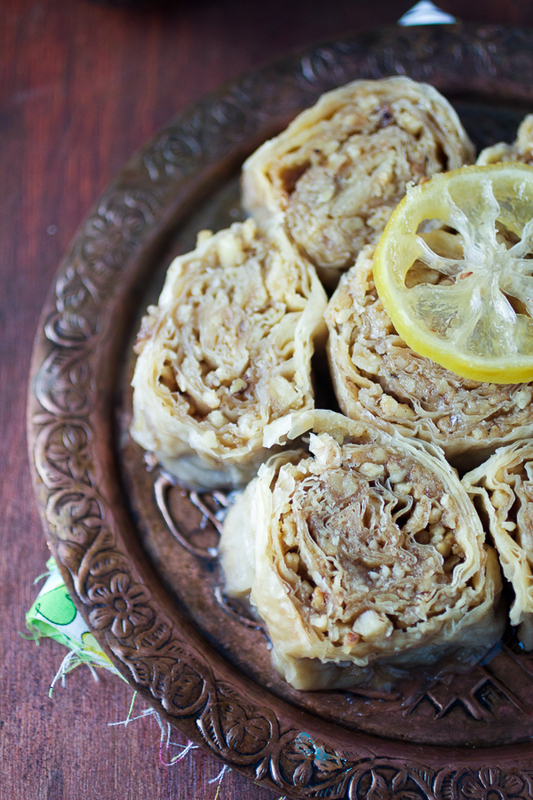 If you’ve ever wanted to make baklava for dessert but it seemed daunting, consider making the roses (baklava’s pretty cousin). Similar taste and an even greater aesthetic. And did I mention they’re much easier to make? Roses, ružice, are a baklava-like dessert also made with phyllo dough. They share the same sweet, soft-yet-crunchy walnut taste, with hints of lemon. 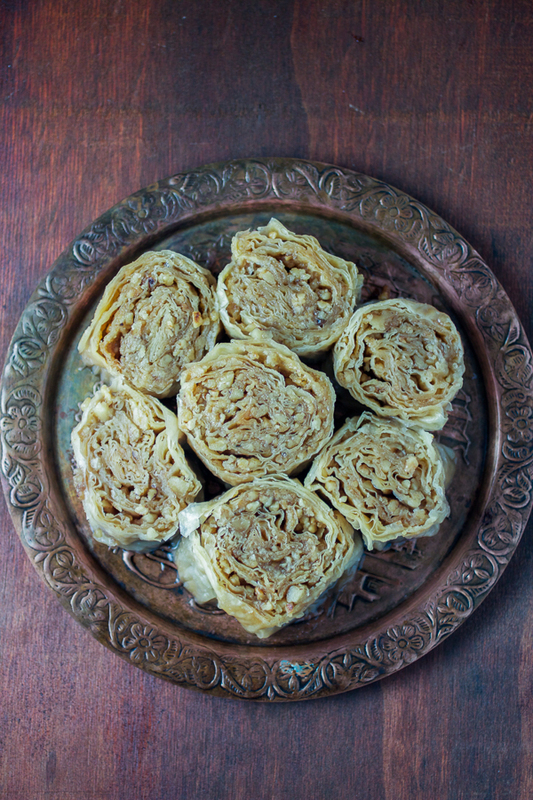 But instead of baklava’s rather technical and precise layering method, roses are rolled up and then cut like a baguette. This results in a flower-like effect from where the dessert gets its name. 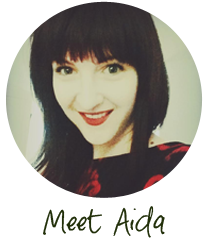 Ružice are also called đul-pita, aka rose-pie and have arrived to the region during the Ottoman rule. Again I want to clarify that they are much easier to make than baklava, but like the baklava, roses are a relatively expensive dessert. This is due to fresh walnuts that are used, which to this day are pricey in the region. 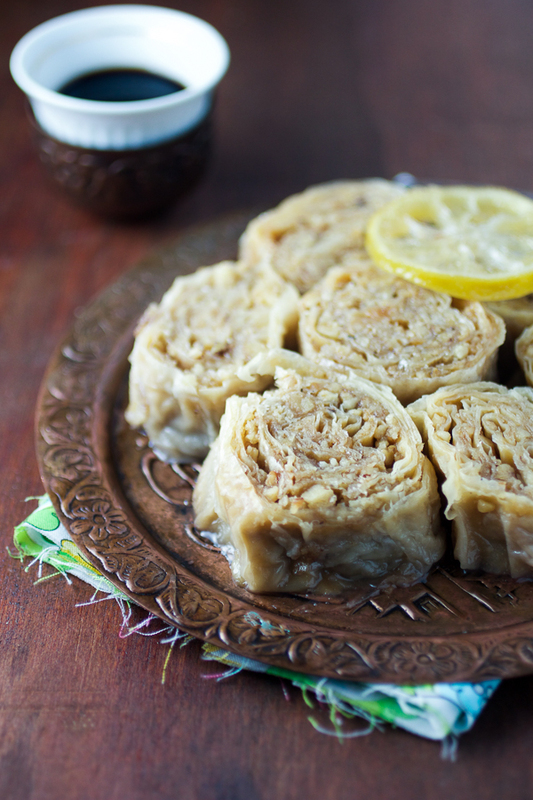 As a result, baklava and roses are generally made for the holidays such as Eid, Christmas or New Year’s. Did you ever classify a dessert based on how “expensive” it is? I remember hearing my mom discuss dessert recipes’ quality relative to how many quality and high priced ingredients it took to make them. An expensive cake was one that required a lot of eggs, nuts, chocolate, and other ingredients that when added together made for an pricey cake. A cheap cake and cookies generally needed flour and sugar. It may be a regional thing. Interesting nevertheless. Bring all sugar syrup (agda) ingredients to a boil on high. (Keep an eye on it because it will boil quickly.) Lower to medium and continue boiling for 15 minutes. Remove off heat and leave to cool. In a bowl combine sugar and walnuts. Integrate well. In a small pan, melt butter on low. Heat oven to 320°F. 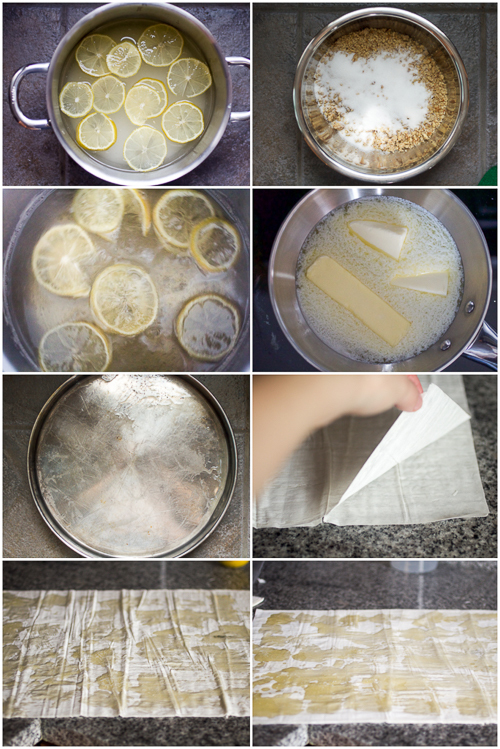 Layer two phyllo sheets together on your working area, and sprinkle the top one with butter generously, making sure the butter is spread evenly over the sheet. Layer two more phyllo sheets on top of the first two, and sprinkle evenly with butter again. (You now have four phyllo sheets layered on top of each other.) Top the fourth layer with 2-3 generous handfuls of the walnut-sugar mixture. Roll everything in very tightly. You should end up with roll that’s about 17 inches long and 3-4 inches thick. Slice up the roll into one inch slices. It should yield about 17 depending on the length of your phyllo dough. 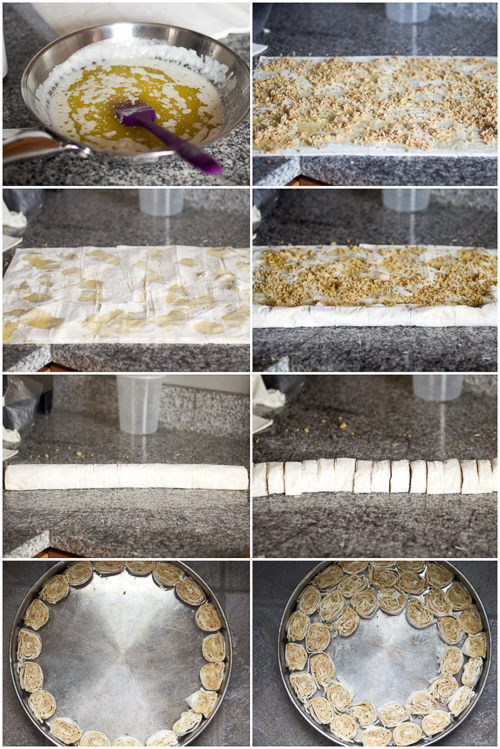 Layer rolls (turned to the side where you can see the filling) into a buttered (preferably round) pan starting from the outside in thus making a circle out of little rounds that look like roses. One roll will give you enough for one third of the the pan. Repeat steps 3-6 for for the second and third rolls. At this point the entire pan should be filled completely with ‘roses’. If there is any butter left, sprinkle on top of the roses in the pan and place it in the oven. Bake for 90 minutes. Take the dessert out, and pour cold sugar syrup over it. Leave to cool off completely before eating. While the pan doesn’t necessarily need to be round, the dessert will look nicer this way. Otherwise use a square pan with the same diameter (13-14 inches). This recipe yields about 50-55 rolls. If you serve two that’s about 25 servings. 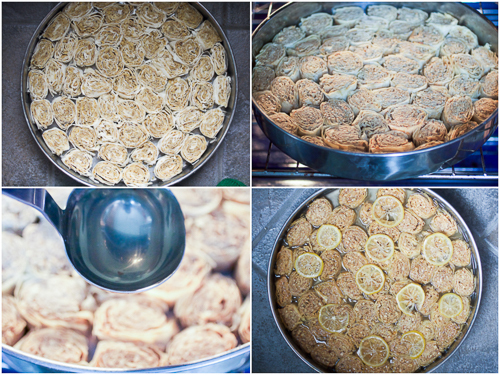 These look amazing, just in time for Bayram!